The Senate passed a short-term spending bill on Wednesday night that would avoid a government shutdown as well as a fight over wall funding. The Senate passed a continuing resolution (CR) spending bill by voice vote on Wednesday night. The spending bill would fund the government through February 8 and would avoid any potential fight over border wall funding until the new year. The House can take up the CR as early as Thursday and could shortly send the bill to President Donald Trump’s desk to sign. If Trump does not approve the bill by Friday, the government would partially shut down. 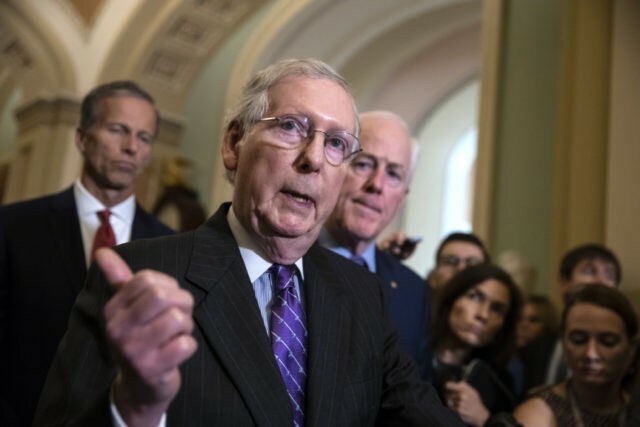 Senate Majority Leader Mitch McConnel said on Wednesday that they will address the government funding fight when they return in February. I’m sorry that my Democratic colleagues couldn’t put the partisanship aside and show the same goo-faith flexibility that the president has shown in order to provide the resources our nation needs to secure the integrity of our borders as well as the safety of American families. But this seems to be the reality of our political moment. The legislation arose as President Trump recently relented on his recent demands that Congress ensure $5 billion in border wall funding in the December spending bill and signaled that he would accept less border wall and border security funding. White House counselor Kellyanne Conway said Wednesday that Trump would “certainly” look at the CR if it were to come to Trump’s desk. Sen. John Cornyn (R-TX), the second highest-ranking Senate Republican, said that although the president remains unhappy with the CR, they believe that he will sign it because they kept other, more controversial measures on the bill. Meanwhile, House Freedom Caucus Chairman Mark Meadows (R-NC), along with many other House conservatives, led a special order on Wednesday night calling on Congress to fund Trump’s proposed border wall. Meadows also called for Trump to veto the spending bill. “Let’s build the wall and make sure that we do our job in Congress,” Meadows said.